Councils are calling for mileage correction services and devices to be banned, after it emerged that there could up to 2.3 million clocked and potentially dangerous cars on UK roads. 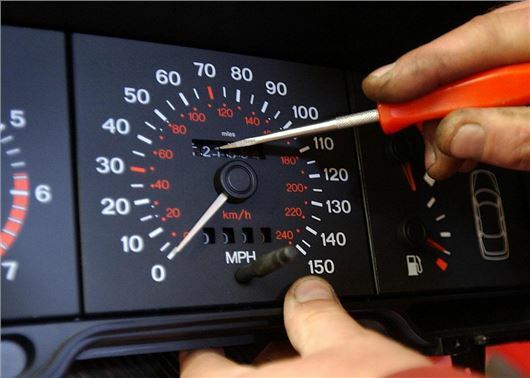 One in 16 vehicles checked now has an odometer discrepancy according to The Local Government Association (LGA) and it is calling for DIY mileage correction tools – widely available for sale online from about £100 - to be made illegal to help combat the problem. "Unscrupulous dealers are tricking unsuspecting buyers into paying thousands of pounds more for a vehicle with false mileage." A legal loophole means that while knowingly selling a clocked car without disclosing it is fraud, it is not illegal to alter the odometer’s mileage. The proposed EU ban on companies providing mileage correction services was supposed to be in place by May 2018, but delays have allowed firms to continue to alter thousands of odometers without any threat of legal reprisal. The LGA – which represents 370 councils in England and Wales - is calling for the legislation to be implemented as soon as possible and retained under UK laws after Brexit. Simon Blackburn, chair of the LGA’s Safer and Stronger Communities Board, said: “Unscrupulous dealers are tricking unsuspecting buyers into paying thousands of pounds more for a vehicle with false mileage, which could put their safety at risk and lead to expensive repair bills if it is in a poorer condition than has been suggested. “Trading Standards teams across the country often receive more complaints about used cars than anything else. This is why the proposed EU ban on mileage correction services needs to be made part of UK law as soon as possible, otherwise thousands more cars will continue to be clocked, jeopardising the safety of cars and passengers on UK roads. Car buyers can take a number of steps verify a vehicle's mileage, including checks with the DVLA for previous MoTs that show the car’s mileage. Buyers can also check the service history to see if the car tallies with the claimed mileage for each year. A heavily worn steering wheel, driver’s seat and pedals can also indicate that the mileage may have been tampered with. Manufacturers should be obliged to fit devices to substantially guard against and detect tampering.That ought to be easy enough. Amongst alleged culprits are lessees, who alter mileage before every service with the intent then to avoid incurring the extra mileage penalties for exceeding their lease agreement mileage restrictions. Perhaps in the future our daily mileage (although not where you've been) could be transmitted up to the Cloud. When electric cars take over the actual state of the battery might produce a useful guide. Checking the MOT history online is an easy way to check this - odometer reading is included on this. When we are free of the EU we can make this a law ourselves without having to compromise and waste time negotiating with 27 other countries. Having been in the industry for 30+ years and bought dozens of clocked cars at reputable auctions, my preferred solution is to require a minor MOT test at 12 and 24 months so that leased reps cars and vans are not clocked just before first MOT - currently at three years - where the mileage is recorded. A good point mentioned covering lessees. Had not really thought of that on and a definite option for the unscrupulous to get around that 6k pa mileage limit. This is hardly new. I knew a person that traded cars and he disconnected the speedometer when he bought a car to use himself and reconnected it a year ;later to sell. Not a huge discrepancy but still fooling a buyer. The service log book is essential as is the condition of all the interior. The suspension show wear faster than many think and a poor bounce indicates a mileage of at least 70K. Obviously buying new avoids this and I rather have a cheaper new car than a dodgy posh car second hand. If I need a new car now I'd get a Dacia brand new as cheap as possible. before you buy a car check on dvla m.o.t website. will tell you vehicle details and mileage when tested. for the last few years.